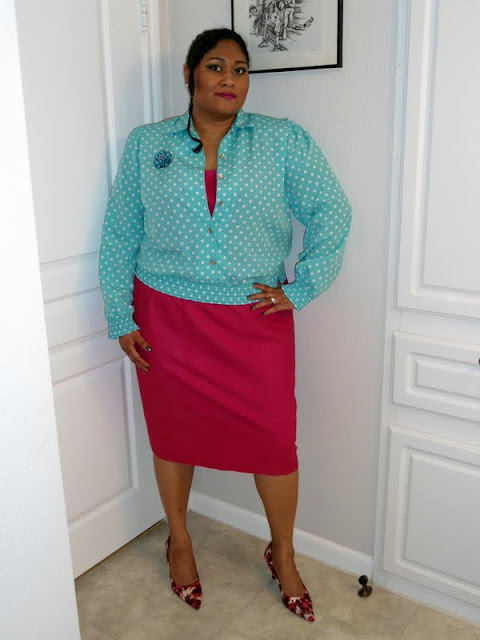 A couple of months ago I found this fabulous polka dot skirt suit at a thrift store here in Dallas. I decided to show a couple of different ways to wear it. The weather here in Dallas has been crazy...there are tornado warnings as I type!! Since I have been unable to take pics outside due to days of wind and rain I decided to play dress up and have my hubby take a few snaps of me in my bathroom. OMG... we have to evacuate for a tornado!!!!!!!!!!!!!!!!!!! I'm back...safe and sound... THANK YOU JESUS! 3 tornadoes have hit here in the Dallas area. We took shelter in the hallway of my building for 2 hours. It seems the tornadoes have moved on toward another direction. WHEW!! SCARY!! Here I am wearing the skirt suit with a stud belt from Lane Bryant and my Jeffrey Campbell wedges. I apologize for the lighting in the pics. Here I am wearing the shirt over top of a hot pink Anne Klein silk sheath dress. The heels are by Sam and Libby. Vintage broach. 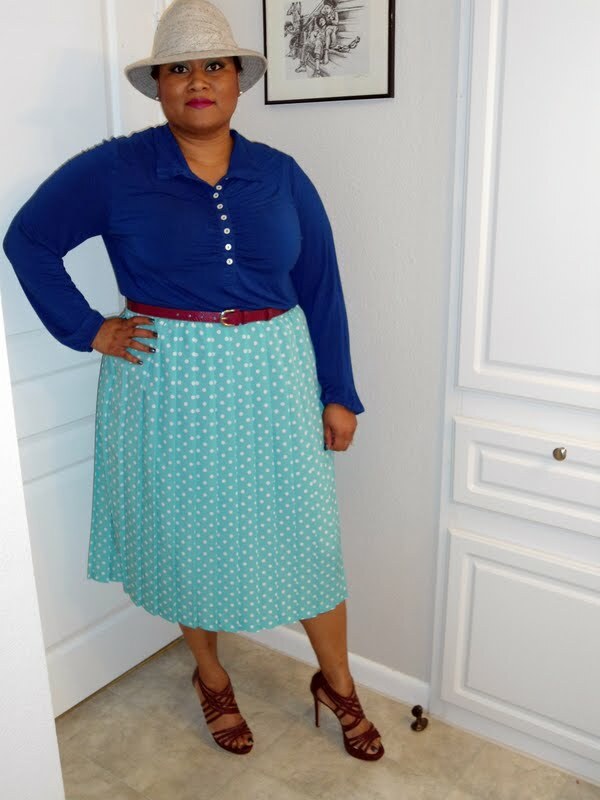 Here I am wearing the skirt with a blue shirt from Lane Bryant, Pour La Victoire heels, Target belt and a vintage men's fedora hat (THAT I LOVE). The belt and shoes are a burgundy color but they turn out brownish in pics for some reason. I also notice that my hot pink lips are not showing up either. I used to associate polka dots with children. Very Minnie Mouse!! Now I LOVE them! I have purchased so many polka dotted things. On another note - I have had 3 herniated disks in my lower back for 15 years now. About a week ago the pain moved to my sciatic nerve. I can't tell you how much pain I have been in over this past week. It has been hard to just get out of bed. I have truly been "SUFFERING"!! Suffering is a part of life. It often seems as if we get through one problem only to face another. A Christian is not exempt from suffering, whatever form it takes – persecution, rejection, hurt, pain, sorrow, loss, failure, hardships, trials and other painful experiences. “More than that we rejoice in our sufferings, knowing that suffering produces endurance and endurance produces character and character produces hope and hope does not disappoint us, because God’s love has been poured into our hearts through the Holy Spirit which has been given to us.” (Romans 5:3-5). OMG Kiah...I'm glad to hear all is well with you and your family! I will definitely keep you in my prayers. On a brighter note :)) I LOVE the way you styled the outfit on each pic! You definitely have style girl;)....and those JC wedges are HOT! You look great and that color looks GORGE on you! I alos LOVE the message! Also, LOVEE the polka dots! And thrift hauls! I love how you mixed it up. You are so creative. I love it! As for your back, my mom had the same issue. They just recently dulled some nerves so the pain wouldn't register in her brain. Now she is walking so much better. I hope your doctors can get you relieve soon. I'm praying for you. this dress is lovely and yes, you're right, it's so versatile! and it fits you perfectly! What a versatile skirt dress. I love each and every pic. I hope the pain in your back gets better. So....I love how you showedvarious ways to stlye this dress and do it Oh so FABULOUSLY!!! 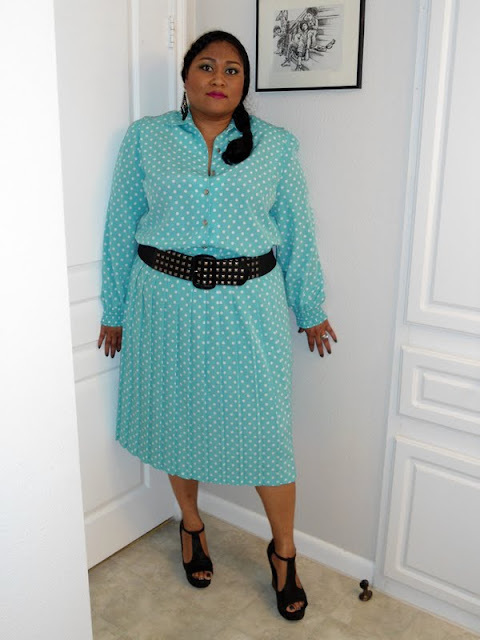 Somethign about a polka dot dress that I just love! It's so feminine and classy!!! GORGE color too! I love it with the red. I spent my evening last night either next to the weather channel on my computer or hiding in a closet for shelter. Praise the Lord you are safe and sound!!!! I'm so thankful you all are safe =) I absolutely LOVE your Polka dot suit every single way you mixed it up is absolutely smashing!!!! I'm praying that Your back will be healed and your pain relieved! I'm so glad to you and your family are safe and sound. I hope you're back feels better! I really loved reading that scripture at the end too! I needed that. 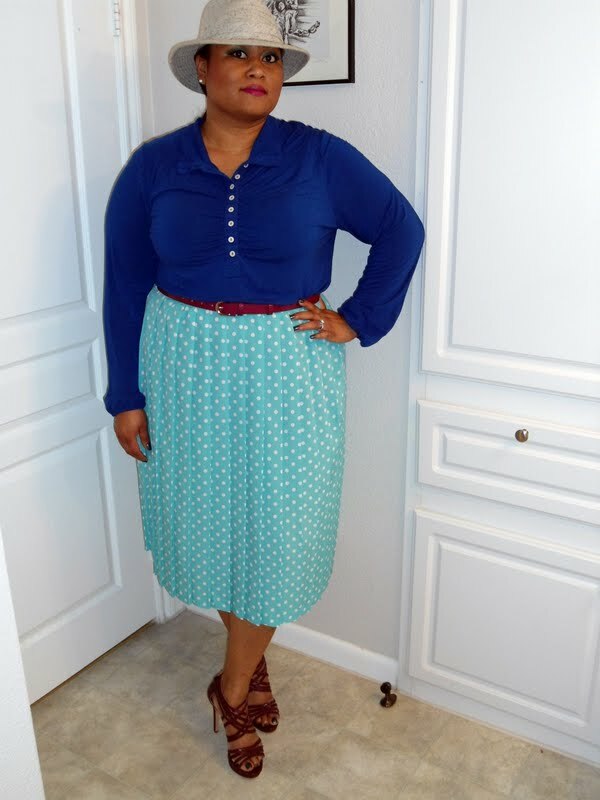 I really love the skirt with the blue!cauuute! but really all of the looks were great! OMG I totally love the pink dress! You look really good in all of these pics! My mom and aunt both have back problems. Very nice outfit combinations. So chic! You always look so well put together. I'm glad to hear that tornado passed you by. I didn't know tornadoes hit that close (I'm in Houston). That's scary! Anyhoo...Sorry to hear about your back. Hope all is well. i really hope you feel better and that the pain will go away soon, luckily you and your family are safe from the tornado, love your outfit all the different ways you wore the skirt suit simply amazing! great outfit with a lot of imagination. Love the plated skirt, it's totaly trendy. i will keep you in my prayers; keep praying and know God will work things out. he always does. Omg Kiah! This was a steal, I love how each outfit looks brand new and jazzed up! 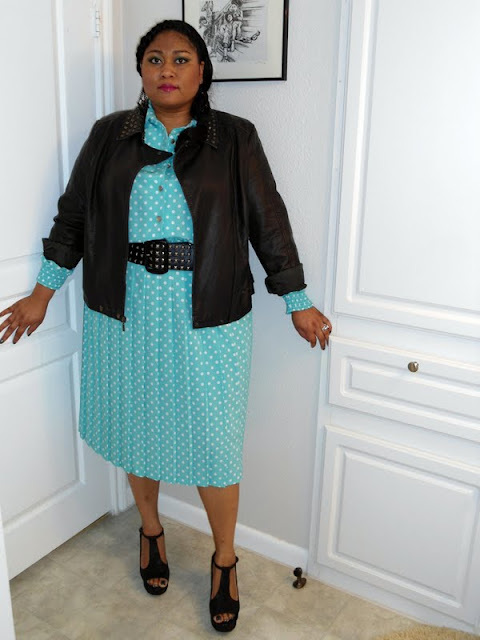 You have the best fashion finds, I really love the polka dots as a jacket look very cute!! i'm so sorry to hear about your back! I hope you get better soon! so sorry I missed this earlier post !!! I will be praying for you, God is a healer! Please take it easy and take care of yourself. What a great find! Lots of mileage to be had from that suit and as with everything- you look fab!